This energy is equivalent to 1.99×10^-22 joules. With this Photon Energy Calculator, you can explore the relation between the wavelength and frequency of the photon and its energy. Read the text below to find out how to calculate the energy of a photon and what is the Planck's equation. The light seems to us to have a wavy character. It diffracts, interferes and refracts. However, at a microscopic level, it is carried by a minuscule quantum of energy called the photon. The energy of a photon depends solely on its wavelength or frequency. Because the light travels, well, at the speed of light we can use either frequency of wavelength to describe it. You can check the Wavelength Calculator to explore the relationship between the wavelength and frequency. The Planck constant is in the units (energy)*(time) and you can think of it as a conversion factor from energies to frequencies. f is the frequency of a photon. This equation gives us an energy of a single, indivisible, quanta of light and we can think of light as a collection of particles. The opposite is also true. We can think about ordinary particles, like electrons, as waves. Check De Broglie wavelength calculator to learn more about this concept. The energy of a single photon is a small number because the Planck constant is ridiculously tiny. The energy of a single photon of green light of a wavelength of 520 nm has an energy of 2.38 eV. 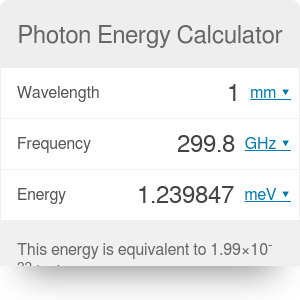 You can use the photon energy calculator to further explore the relationship between the photon energy and its frequency or wavelength. Photon Energy Calculator can be embedded on your website to enrich the content you wrote and make it easier for your visitors to understand your message.